The Cascade Chorale members would like to express their gratitude for the scholarship support, provided by the Wilson family, honoring the memory of Chris Wilson. Chris was an outstanding musician who played a variety of instruments and taught music, especially classical guitar, in Central Oregon for years. He loved music and imparted that love to his students through teaching both music and the history behind that music. Many of the Chorale members knew Chris; it is especially meaningful that his family established this music scholarship in his memory. Community performances add to the rich culture of Bend. The tradition of this group singing together has been going on for over 40 years! It provides a venue for up to 100 singers to sing together, some of whom have been with us for over 30 years and they want the Chorale to continue. In recent years, quite a few people have found the cost of tuition each term beyond their means, causing a loss of good voices in the Chorale and threatening the stability and future of the group. This not only affects the individual singers, but it affects the members of the community who have enjoyed the performances over the years. The challenge we face is to find a solution that will ensure stability for many years to come. 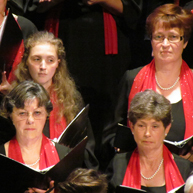 Cascade Chorale is looking for sponsors who would be interested in supporting our program. A donation of any kind would assist in helping future COCC students in tuition costs, enabling them to fulfill their love of singing, to learn more about conducting, and, in some cases, to earn academic credits towards their degrees. All sponsorships will be acknowledged in the concert programs. We hope to hear from you and appreciate your consideration to help us in this way. Most of all, we appreciate your attendance at our concerts and hope you enjoy the music!